The rhizome of Picrorhiza serophulariiflora Pennell of family Scrophulariacea. Mainly in Yunnan province and Tibet Autonomous Region of China. Light smell, extremely bitter taste. Large without rootlet, light weight, crisp, extremely bitter. Bitter, cold; liver, kidney, stomach and large intestine meridians entered. Clear deficiency heat, relieve malnutrition fever, clear heat and resolve dampness. It can clear deficiency heat, relieve malnutrition fever, and is indicated for fever due to yin deficiency, bone-steaming tidal fever and night sweat. It is often combined with yin-nourishing herbs, for example, Zhi Mu and Bie Jia in Qing Gu San from Zheng Zhi Zhun Sheng. It also excels at relieving children's malnutrition fever. For treating children's dyspepsia, warm accumulation and stagnation in the intestine, abdomen distention. 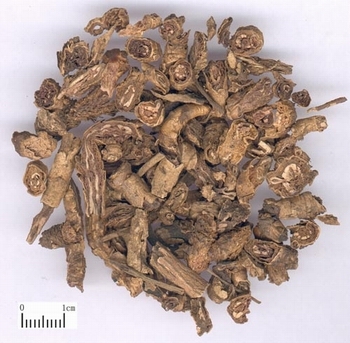 emaciation and lingering low-grade fever, it is combined with spleen-invigorating and food-stagnation-resolving herbs, such as Bai Zhu, Shan Zha, Shi Jun Zi and so on in Fei Er Wan recorded in Yi Zong Jin Jian. It can clear heat as well as dry dampness, especially excel at clearing damp-heat in stomach and intestine, so it is the good herb for treating dysentery due to damp-heat. It is often combined with heat-clearing, dampness-drying and dysentery-checking herbs for mutual reinforcement, for example, Huang Qin, Huang Lian, Bai Tou Weng and so on. In addition, with the combined actions of heat-clearing, fire-purging, toxicity-removing and swelling-relieving, it is also indicated for damp-fire accumulation in large intestine manifested as hemorrhoid with swelling pain, sores and abscess due to heat-toxicity and blood-shot eyes with swelling pain due to liver heat, and it should be combined with related heat-clearing and toxicity-removing herbs.